Energy storage advancements will become an important enabler for communities transitioning to cleaner methods of energy production, according to EnergyNest CEO Christian Thiel. EnergyNest is an energy storage system. It completed its first pilot installation at Masdar Institute’s Solar Platform, in Abu Dhabi, United Arab Emirates in the second half of 2015. 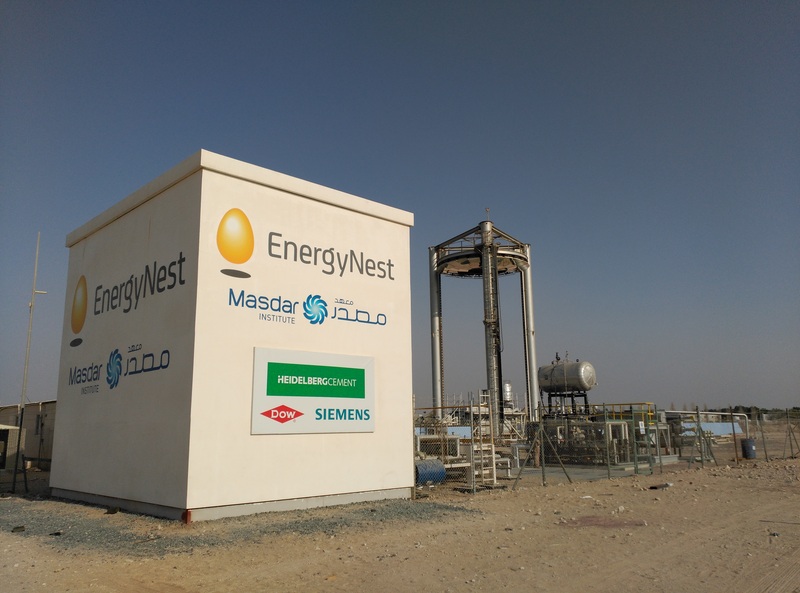 The pilot installation includes two 500 KWh thermal energy storage “nests” showcasing EnergyNest’s modular solid-state thermal energy storage (TES) system. In the Masdar pilot, two nests are connected to a solar facility. The TES system stores excess solar-derived energy as thermal energy during the day and then uses the thermal energy to power a turbine once the sun has gone down. The modular design of the nest enables deployment to be tailored to each specific energy-generating facility. The nests are built out of special concrete with thermal properties, named “heatcrete,” which prolongs the life of each nest. Heatcrete offers 70% higher thermal conductivity and around 15% higher heat capacity than other TES-specific concretes. The nests are designed to store energy for around 3 hours. Applications include TES for concentrated solar power (CSP) plants, and can be used for a range of heat transfer fluids (HTF) thermal oil, water, steam, compressed gases and potentially two-phase HTFs such as water/steam in phase transition. CSPs are used often in industrial applications including electricity production, seawater desalination, process steam generation and enhanced oil recovery. EnergyNest can also be used for other fluctuating renewable energy systems, including wind and PV solar.